Hassan attracts a number of tourists day by day. 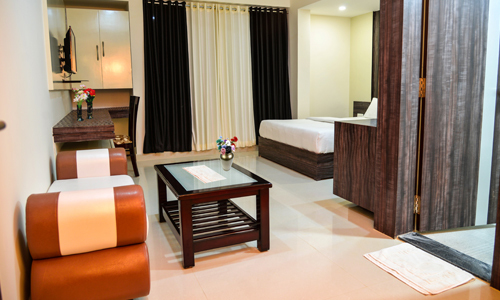 Hibiscus suites are executive rooms designed for family. 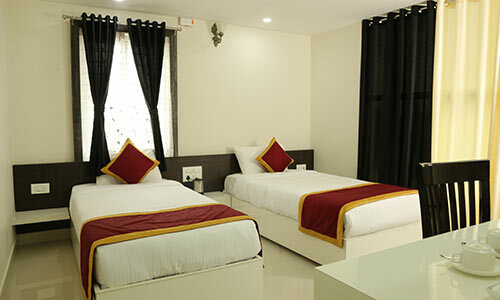 Rooms are provided with Twin Beds, equipped with facilities like complimentary hi speed Wi-Fi, tea coffee maker and LCD TV along with the basic facilities. Perfect for a comfortable stay in Hassan if you are in a business trip alone or even with your family or colleagues. We assure you complete privacy with good security and above all we give importance to your convenience by providing a hygienic deluxe room and bathroom facility. Amber Castle hotel offers 15 well-furnished spacious Hibiscus suits.